Like the Workbench thread, this will be a general dumping-ground of finished products. Due to the rather erratic focus I have on what I paint, this suits me well enough. Today isn't much. 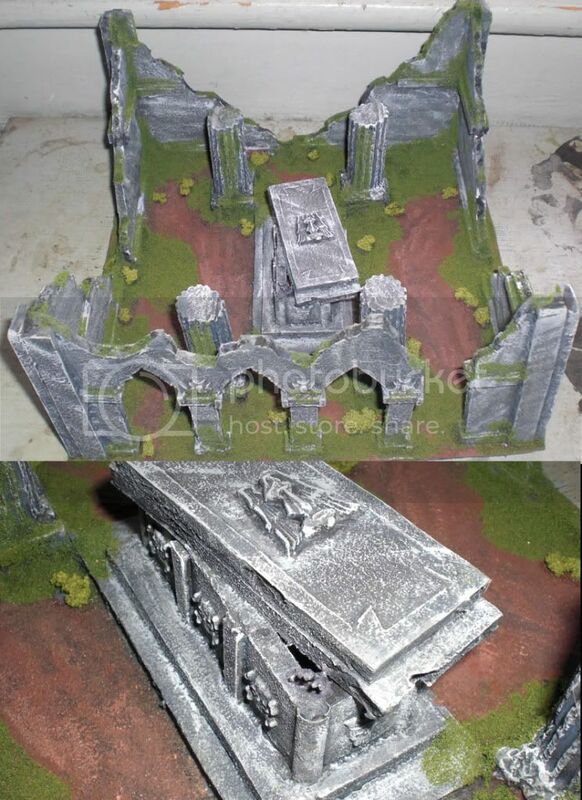 Two pieces of terrain here: the first, is for the Mordheim campaign. 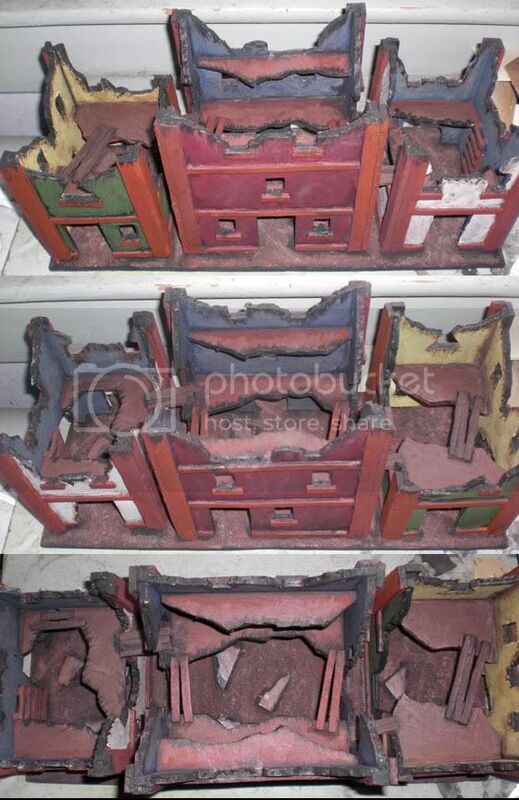 I experimented with the idea of doing 'strips' of buildings, that can act like instant streets and can connect several buildings together all on one piece of basing board. It didn't turn out QUITE like I expected, since the middle building was bigger than the others (whoops! ), but it was a learning experience nonetheless. This one is actually for Dez and his soon-to-be-finished gaming den. He's asked me to make several pieces of terrain for him, and this is just one of them. I got the idea from the ancient White Dwarf #135 on a rainy day a few weeks ago, and I would've had it finished earlier but it took me some time to track down pillars (Petco, $2 per, not a bad deal!). I modified what was supposed to be an altar into a crypt, with a stealthy lil' zombie-hand poking out. Ooo, spooky! I've been productive with all the rain we've had! Kamilah, painted and ready to rock. The two Berserkers for the Norse warband (and will be taking double-duty as unit champions for my WoC army). Nose Shaman. Might use him as a wizard or something. And some Mordheim counters. I don't know where the treasure chest came from, but it's gotta be useful for something! Finished the Hunter last night. Due to some issues with my matte varnish spray I had to go back and touch up where that annoying 'white dust' landed. It's still noticeable under the bright flash, but in-person you can't really see it. And, the Steamborg Executioner. No dust this time around! The skin was kind of a pain, since at one point I mucked up the purple wash and had to paint over the skin again. All came out well in the end. Look really good. That was super fast too. Inquisitor Wall wrote: Look really good. That was super fast too. 80% of my work is planning, honestly. Once I figure out how I want to do it in my head, I can usually blaze through it in just a few hours. More work went into building them than painting them. I've had that happen with the primer... one of my best painted models got ruined with that. stupid primer. Finished the Alps that Abdiel commissioned me for. They haven't been given a coat of matte varnish yet, due to not having a can at the moment, but that will be rectified in the morning. They look great. Nice contrast between the 3 of them.